Sorry for the long delay between posts! Our baby boy was born a week after his due date on January 15 via induction and its been both a wonderful a hectic seven weeks getting used to being a first-time mama. Now that the little one is taking semi-regular naps and we have breastfeeding almost down to a science, I hope to resume our regular posting schedule! 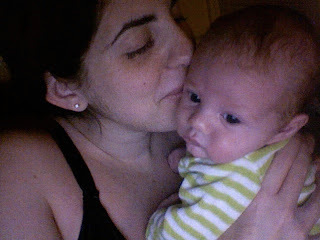 I'm looking forward to future posts and imparting some of the still-limited mama wisdom I'm gaining. My but the learning curve is steep, but I hope you'll learn along with me! Congrats! Glad to see you again, and your little one is just adorable. Post more pics too!